Bible prophecy shows that Europe and the Middle East are to be the main focus of end-time events. Recent and future developments show continuing upheaval in both regions. In a parliamentary system, there is provision for a vote of no confidence in the prime minister. Mrs. Theresa May survived a vote this week. 200 MPs supported her, with 117 voting against. The fact that she has survived to see Brexit through to completion, however, is not necessarily a good thing. Mrs. May has been racking up the frequent flyer miles flying around to European capitals in pursuit of a “deal,” a deal that will keep the UK close to Europe after the people voted to leave it! The Europeans have said that they will not offer anything better than the deal they offered a few weeks ago, a deal that will, effectively, make the United Kingdom a vassal state of the European Union. Some deal! Why is the British prime minister so intent on a “deal” that will enslave the country for decades to come? Why can’t England walk away from the EU, which is what the voters voted for in the referendum of 2016? Doesn’t anybody have any recollection of how the United Kingdom was a successful trading nation prior to the EU? Clearly not – as they don’t think that Britain is up to it any more! 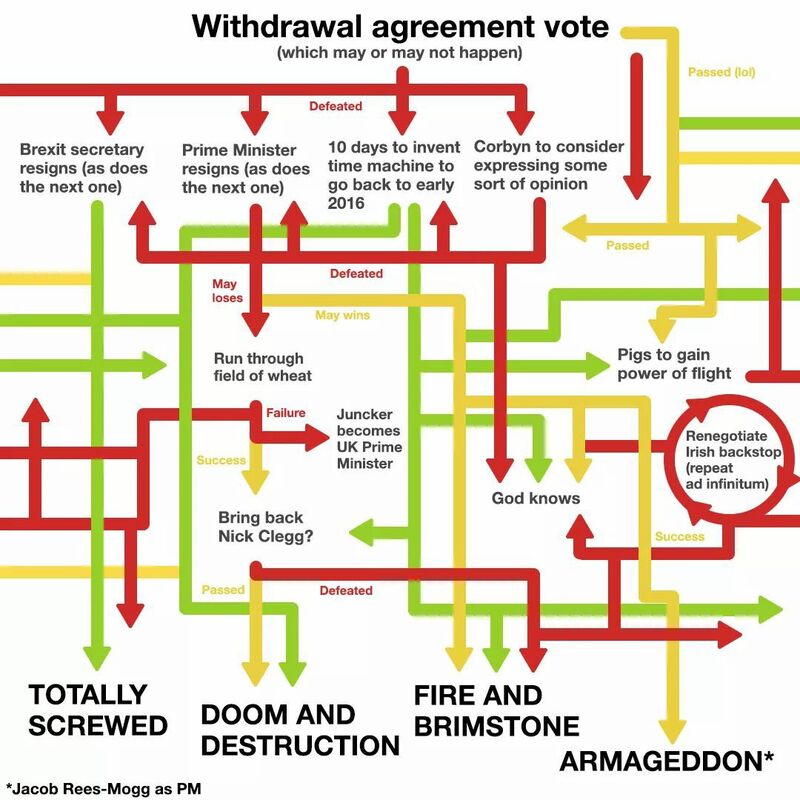 The only hope left is if the country ends up with “no deal” on March 29th. Then, she will be free to pursue other trade deals with nations around the globe. Britain isn’t the only country finding it hard to break away from a super-power. Since World War II, Germany has submitted herself to the leadership of two other western powers. First, the United States. Through membership of NATO and other international institutions, Germany has played a vital but secondary role in international affairs. Secondly, to France, through the European Union. Mrs. Merkel is leaving office at a time when these two pillars are crumbling. The United States, under Donald Trump, has “nullified every assumption that Germany … made since 1945.” Germany, now under great pressure from the US to contribute more to western defense, can actually now break free from US dominance and go her own way. But in which direction should she go? Mrs. Merkel’s successor will have to pave a new path for the country. At the same time as relations with Washington are changing, so are relations with neighboring France. Mr. Macron, the French president, began his presidency 18 months ago with a bold new vision for Europe. This vision is now in ruins as the people revolt against his leadership and the economy is seriously threatened by continued riots. At the very least, Mr. Macron will have to focus his attention more on France itself; there will be little or no time for Europe. This coincides with Brexit, which will see the United Kingdom leaving Europe. So, out of the Big 3, only one is left able to lead the European project. And that country is Germany. US PULLING OUT OF MIDEAST? A second article in The Economist’s “The World in 2019,” predicts “The end of American hegemony” in the Middle East. This process began a few years ago. American detachment from the Middle East will likely result in continuing conflicts in Yemen, Libya, Syria; it could also mean no deal between the Israelis and the Palestinians; and we will likely see Iran strengthened both domestically and regionally, with Hezbollah posing a greater threat to Israel. American detachment will also see Russia filling the gap, with European nations desperate to halt Russian encroachment into the area.